The following fare rates will take its effect next year after the Land Transportation and Franchising Board (LTFRB) approved the petition to increase the fare for Taxis in Metro Manila. The above changes will take effect sometime in the middle of January, 15 days after its official publication in the newspaper. It’s Christmas day for most part of the world today and so is here in the Philippines. Crowded shopping malls, traffic roads, lanterns and Christmas lights are common sign of the busy holiday. In addition, Christmas carols are in every radio stations and music players. Since, Christmas is claimed to be a celebration of Jesus Christ’s birth, I conducted a little test to see how people do in the internet. I would like to know how internet people think in this season. 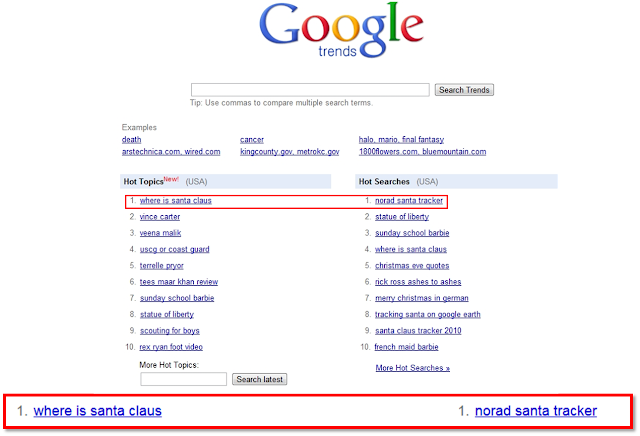 I used Google Trends, a popular web stat tool that tracks down search terms inputs in Google around the world. Image via Wikipedia UPDATE: President Benigno 'Noynoy' Aquino III declared through Proclamation 84 the list of official regular and special holidays for 2011. In just a few more days, year 2010 is coming to its end and as the cycle goes, a new year will begin. The challenges and triumphs we had this year will just be memories of the past, worthy of remembrance. Now, its time to look forward to the coming year. Image via Wikipedia Hubert Webb and 6 others were acquitted by the Supreme Court in a 7-4-4 vote. The court reasoned that the prosecution failed to establish "guilt beyond reasonable doubt". Huber Webb, the son of Former senator and eight others were the prime suspect in a gruesome massacre that killed the family of the widower Lauro Vizconde in what we all know as the "Viszonde Massacre" of 1991. The case went on for almost two decades, with Huber and six others having been convicted in the Lower Court and Court of Appeals. The supreme court decision is already available at Philippine Supreme Court's online archive. Decision: People of the Philippines vs Hubert Jeffrey Webb et.al. Malacaňang Palace today confirmed that December 31, 2010 will stay "as is" as a special non-working holiday based on Procalamation No.1841 by former president Gloria Macapagal Arroyo. Based on the tweet (@govph) from Philippine Government's official gazette, all holidays for December 2010 will stay on the dates originally scheduled (Proclamation 1841). The following are the remaining holidays for December 2010. Those who will be required to work on these dates shall be paid additional premiums as dictated by Labor Code. DFA Adopts ISO Standard initial "PH" or "PHL" for Philippines; Dumps "RP"
Image via Wikipedia The Department of Foreign Affairs (DFA) will now officially use ISO standard initials for the the Philippines, "PH" or "PHL" replacing the ambiguous "RP". This conformance to International Organization for Standardization (ISO) is expected to help alleviate the confusion by using the the initials "RP" which is easily confused with other countries. These country initials is part of the ISO 3166 standard adopted by the ISO that defines codes for the names of countries, dependent territories, and special areas of geographical interest. Money: Jollibee to Buy Mang Inasal! "The Jolly Bee is eating Mang Inasal chicken!" Tony Tan Caktiong owned Jollibee Foods Corporation, the largest fast food chain in the Philippines announced the acquisition of the seven-year old fast food chain Mang Inasal! According to the disclosure, Jollibee will be buying 70% of the shares of Mang Inasal for a sum of 3 Billion pesos. Mang Insasal, a relatively start up fast food chain has seen a rapid growth in the recent years. Since it started in 2003, Mang Inasal already boasts a total of 303 stores around the country, most of which are franchises. Recent financial reports shows that the young company is already earning a revenue totaling to 3.8 Billion pesos. Mang Inasal has been known for its delicious roasted chicken and "unlimited rice". They also sell products that are relatively cheaper compared to other established fast food chain. These and other key marketing strategies seems to have boosted the company's growth. DepEd Joins PAGASA in Twitter! Image via CrunchBase Department of Education (DepEd) recently joined PAGASA in twitter! While PAGASA is twitting weather updates, DepEd twits class suspension announcements. DepEd's official twitter account is @DepEd_PH. Follow @DepEd_PH on twitter and receive timely updates. Recently, several government agencies has been using social media channels to facilitate fast distribution of information. Among them are the president's office @govph, MMDA @mmda, and PAGASA @dost_pagasa. PAGASA is now on Twitter! Image via Wikipedia Philippine Atmospheric Geophysical and Astronomical Administration (PAGASA) is now using twitter to facilitate the fast distribution of information especially weather updates. PAGASA's twitter account is @dost_pagasa. By following @dost_pagasa, you can receive real time update from the agency regarding weather forecast, typhoon updates and other services provided by the agency. This move by PAGASA is very timely since currently, typhoon "Megi" is threatening to pass over the Philippine area of responsibility. This move by PAGASA to use social networking site is the latest among the government's moves in the effort to use social media to inform the public. We can remember that in the previous months, the government launched its official gazzete online at www.gov.ph. Also, the Department of Finance recently launchedwww.perangbayan.com to gather information regarding corrupt officials under its umbrella. What's Wrong with Cebu Pacific Flight Attendants Dancing? Image by georgeparrilla via Flickr Although generally, many people were amused by the "Dancing Flight Attendants" number from Cebu Pacific Airlines, there are also those people and groups who don't feel the same. Two of them are the Flight Attendants' and Stewards' Association of the Philippines (FASAP) and the notable women's rights group GABRIELA. Note: Cebu Pacific's attendants are not part of FASAP. Both of these groups shows concern of the incident. In a press release statement, FASAP said that they are "deeply perturbed by the recent video spreading in the internet showing dancing flight attendants while performing the safety demonstration of the flight." They reasoned that it may eventually lead the public into "stereotyping of flight attendants as entertainers" and will surely have a negative and sexist impact in the minds of the public". They even called the activity as "demeaning and undignified". Last week, the entire world was caught in amazement by the surprise in-flight "dance" number performed by Cebu Pacific flight attendants. Well, the surprise doesn't end on that number. As part of Cebu Pacific's culture of continuous innovation, today, they presented the "male version" of that number. In a flight from Manila to Davao, the passengers were once again entertained, this time by male flight attendants. Here's the video of the "Dancing Male Cebu Pacific Flight Attendants". How was number? Is it good? Image via Wikipedia Astronomers recently found a planet outside the solar system with conditions they termed as "Goldilocks", neither too hot nor too cold. This they said was the perfect condition for a great possibility of extra terrestrial life. The planet is named Gliese 581g is found to be circling a red dwarf star located 120 trillion miles from the Earth. The planet is a few times larger than the earth and scientists estimate that the mass and gravity of the planet is just comparable to the earth. the planet is also tidally locked to its parent star which means that only one side faces the star. This condition will lead to a very hot condition on the portion directly facing the star and an icy condition on the other side. The interesting part though is somewhere in the middle of the two faces of the planet where the temperature may be just right for a habitable zone. Cross posted from ASTRONOMY DIGEST BLOG. Holiday on October 25 2010? Image via Wikipedia Should October 25, 2010 be declared as a holiday? The Comission on Elections (COMELEC) says so and they are requesting the office of President Noynoy Aquino an executive order (EO) for that. Their basis is the law that states that all election day be declared as holidays so that more voters will turn out. By the way, October 25, 2010 is the schedule for the local Barangay and Sangguniang Kabataan (SK) elections. I love Cebu Pacific as an airline who's innovative marketing strategy enables every-Juan to fly. And now, Cebu pacific is taking us to the next level of their innovation---entertainment. Watch the video below as the gorgeous Cebu Pacific flight attendants showcase their talents in dancing as they remind us on the safety features of the aircraft! After watching this video, I felt like I want to book my next trip as soon as possible! I want to see this in personal! Image via Wikipedia If you will be travelling without check-in baggage like the famous Cebu Pacific Go-Lite promo, better not to bring your umbrellas. Before, we just fold our umbrellas and keep it inside our hand carried bags. Now, there's a new security order to include umbrellas in your check-in baggages. Well, again, if you happen to be travelling with Go-Lite ticket, then you would have to pay 400 pesos for baggage reinstatement. I just had this experience when I traveled a few weeks ago. After getting the boarding pass from Cebu Pacific counter and paying the terminal fee, we are told at the final inspection that umbrellas should be checked-in. How annoying it is to imagine how long we been standing there in the line to the counters and to think that it was not even mentioned on the first inspection! It's official! Under proclamation no. 26 signed by President Benigno "Noynoy" Aquino III, September 10, 2010 (Friday) will be a regular NON-WORKING HOLIDAY in the observance of EID’L FITR (FEAST OF RAMADHAN) . If you are required to work on that date, you should receive additional payments in accordance with the labor code. The official proclamation was signed by President Aquino last September 2, 2010 and was posted at the Philippine Government Official Gazette at www.gov.ph. After the outrage over the incident that happened last August 28, 2010 when a donated kidney was spoiled after being refused for boarding on its aircraft, Cebu Pacific manangement issued an official statement. In summary, the airline defended the pilot's discretion pointing out that the National Kidney and Transplant Institute (NKTI) did not follow prescribed international procedure regarding transporting human organs. The airline also assured the public that they already have discussions with NKTI to prevent similar incidents in the future. Here's the list of the examinees who garnered the ten highest places in the recently released Nursing Board Exam results. The Professional Regulations Commission announces that 37,679 out of 91,008 passed the Board Exam for Nurses in the Philippines administered by the Board of Nursing in the cities of Manila, Baguio, Cagayan de Oro, Cebu, Dagupan, Davao, Iloilo, La Union, Legazpi, Lucena, Pagadian, Pampanga, Tacloban, Tuguegarao and Zamboanga last July 2010. The result came in after 42 days. Registration for the issuance of PRC ID requires the following. Venus Raj's "Major Major" is a Hot Topic in Twitter! Miss Philippines Venus Raj answer to the final question in the 2010 Miss Universe beauty pageant became a hot topic in the country. 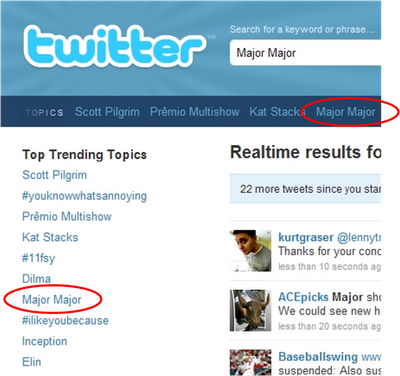 The word "major major" , echoing Venus's answer ,is one of the trending topics on twitter. It even became a popular punchline among Filipinos jokes. Manila Hostage Taking - What Went Wrong? As everyone knows, the hostage-taking fiasco last Monday end up in a very disturbing manner. Nine innocent lives were wasted in a meaningless bloodshed. A group of tourists who came to the country to enjoy will be going home in boxes. It was a sad and horrible outcome like most of the seemingly getting common incidents of fear due to the relentless evil deeds. In the last article posted on this blog, I featured a web article showing how the media could do better in broadcasting cases of crisis like hostage-taking incidents. Now, the British Broadcasting Corporation-Asia Pacific (BBC) published an article entitled, "Ten things the Philippines bus siege police got wrong". It features comments from Charles Shoebridge, a security analyst who has worked in British Army and Scotland Yard for counter-terrorism. Read the article below and see what could've done better by the Philippine police during the course of the bus siege. Image via Wikipedia The horrifying hostage taking incident that happened yesterday came into a disturbing conclusion. Nine innocent lives were taken in a meaningless bloodshed. Who should take the blame for this horrendous display of evil? Is it the hostage taker? Is it the police? Many will say that the police authorities failed to handle the situation wisely. The Hong Kong government already expressed its disappointment over the incident. It was indeed very clear from yesterday's incident that the country's competence in maintaining peace and security is seriously flawed. Also worth taking note of is how the media behaved during the course of the incident. The media has been criticized for giving information to the hostage taking on which we cannot deny that it may have contributed to his agitation. I found this very nice article about how the journalists should have responded in those crises. Galactic Inbox : A Gmail Inspired HTML 5 Game! Gmail's official blog recently posted this funny post introducing a cute game inspired by Gmail itself. The creator called it Galactic Inbox. 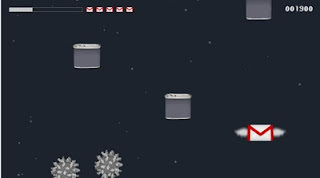 It is a fun game featuring a space ship powered with missile. It is also made using HTML 5, the latest HTML version that focuses on multimedia applications in the web. According to the blog post, the creator made the game as a "thank you" to Google team for their untiring efforts in developing the web-mail. Take note that you need a web browser that supports HTML 5 before you can play it. The latest versions of Firefox, Chrome, and Safari supports HTML 5. Try it and have some fun! Image via Wikipedia In line to its mission to be more transparent on how the money of the Filipino people are used and also to be more vigilant against corruption, the Department of Finance launches a website that will provide a feedback mechanisms directly from the citizens. The website is www.perangbayan.com . The name if translated to English is close to “Money of the People”. The website uses social networking strategy to gather the information about graft, improper action, negligence, lavish lifestyle and other illegal practices that involves the Department of Finance and other government agencies attached to it like the Bureau of Internal Revenue (BIR) and Bureau of Customs (BOC). Aside from reporting negative incidents, citizens are also urged to report positive actions from these agencies. To know more about the website and how reporting is done, visit the website at www.perangbayan.com . Image via Wikipedia We all take a close look at our personal salaries, earnings or allowances. And admit it or not many of us always complain about it. Here are some common complaints. It's too small!It's not enough for me and my family.How can I budget this?I'm underpaid.I worked hard for this?How can I possibly live with this amount?The tax is too big! The list is definitely longer than this. Yes, salary is one of the hottest and most controversial human inventions and it has always been like that since the beginning. Yahoo! Mail Hacked - What Should You Do? It was Monday morning. I opened my Gmail account and found a strange message: an email message from my Yahoo! mail account. The actual email message is shown below. hey,how are you ?Just received my iphone "3"gs 32gb from this website. www. deouer.com , much cheaper than others and genuine . if you would like to get one,you can check it out,Regards,(my name)Note: DO NOT ATTEMPT OT VISIT THE SITE MENTIONED IN THE SPAM MAIL ABOVE. IT CAN BE DANGEROUS. I immediately accessed my Yahoo! Mail and found out the disaster. Somebody had accessed my account without my knowledge and sent spam messages to ALL MY CONTACTS. Some of them even replied and asking if what I sent is really true. Of course, I replied and explained what happened. Image via Wikipedia To further the damage, I also found out that ALL MY MESSAGES, (Inbox, Sent, Draft, and Spam) has been DELETED. Also, my ENTIRE CONTACT LIST has been DELETED. How to Fix Hacked Yahoo Account?